This eye-catching Blatz Beer sign is defintely a conversation piece. It does show minimal signs of wear. We have tested the light by electrifying it continuously for 8 hours repeatedly and no problems were reported. Johann Braun opened City Brewery in 1846. Valentin Blatz established a brewery next door in 1850 and merged both breweries upon Braun's death in 1852. The brewery produced Milwaukee's first individually bottled beer in 1874. It incorporated as the Valentin Blatz Brewing Company in 1889, and by the 1900s was the city's third-largest brewer. During Prohibition, Blatz produced non-alcoholic beverages, from 1920 to 1933. In 1933, Blatz was issued U-Permit ¹ WIS-U-712 granting permission to resume brewing beer. In 1958, Pabst Brewing Company, then the nation's tenth largest brewer, acquired Blatz, the eighteenth largest, from Schenley Industries. In 1959, the federal government brought an action charging that the acquisition violated Section 7 of the Clayton Act as amended by the Celler-Kefauver Anti-Merger amendment. The sale was voided in 1959 and Blatz closed that same year. In 1960, the assets of Blatz, including its labels, were sold to Pabst. 1879 advertisement for Val. Blatz's Milwaukee lager beerIn 1969, Blatz was acquired from Pabst by the G. Heileman Brewing Company. Heileman, in turn, was acquired by the Stroh Brewery Company in 1996. On 8 February 1999, prior to its disolution in 2000, the Stroh Brewery Company sold its labels to the Pabst Brewing Company and to the Miller Brewing Company. By 2007, Blatz was once again part of Pabst. Innovation While the Joseph Schlitz Brewing Company was "the beer that made Milwaukee famous," Blatz Brewing Company was, in fact, the first to take its product national. Two famous Blatz/Milwaukee beer marketing slogans were "Blatz—Milwaukee’s Finest Beer" and "Blatz—Milwaukee’s Favorite Premium Beer." In later years, the brewery described its product as “Draft Brewed Blatz.” The most famous jingle from the 1950s to early 1970s had the words, "Kegs, Cans, or Bottles, all taste the same. 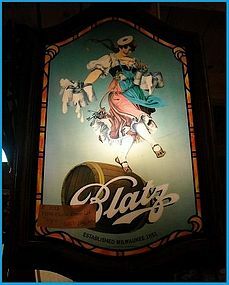 The three best is one beer - Blatz is the name," playing on the fact that many other beers had a different taste when bottled and canned from how they tasted fresh from the keg. The Blatz Brewery Complex and Valentin Blatz Brewing Company Office Building in downtown Milwaukee are listed on the National Register of Historic Places. The brewing company’s office building has been converted into condominiums. The former Blatz bottling facility is now the Campus Center Building for the Milwaukee School of Engineering. The office building has been converted into the school's Alumni Partnership Center. Today The "Blatz" beer label currently is produced by the Miller Brewing Company of Milwaukee, under contract for Pabst Brewing Company, managed by CEO, Charles Thomas Blatz who coincidently shares the last name of the previous founder. The Blatz Brewery Building was purchased and converted to condos in 2005-2006. The Blatz building's downtown location has made it a premier place to live in Milwaukee. In 2008, Blatz Beer made its return to the brewery building. Rather than being brewed there, however, it is merely available for purchase from the Blatz Market & Liquor.